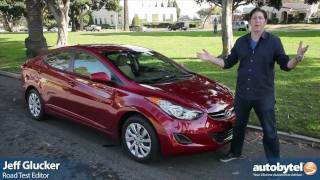 Hyundai Elantra 2012 exemplifies Hyundai’s emotional “Fluidic Sculpture” design principles. “Fluidic Sculpture” considers the interplay of wind with rigid surfaces to create the illusion of constant motion. 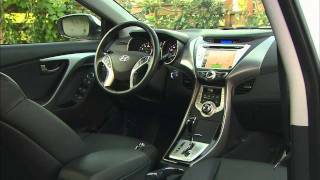 Elantra is an evolution of the design qualities found in Sonata. 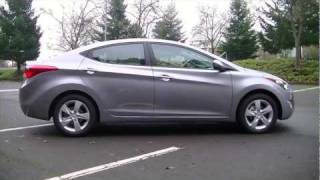 Considering that the OTR price for Hyundai Elantra 2012 is $15,195, its a compelling option for the consumers looking for compact car. Elantra exemplifies Hyundai’s emotional “Fluidic Sculpture” design principles. “Fluidic Sculpture” considers the interplay of wind with rigid surfaces to create the illusion of constant motion. Elantra is an evolution of the design qualities found in Sonata. Along Elantra’s sides are Sonata’s flowing lines, with the addition of a strong undercut feature line starting at the front door. These lines, along with muscular wheel arches and a sleek roofline, create a memorable and spacious package. Flowing lines also lead to an aerodynamic body. The drag coefficient for the Elantra is an exceptionally low 0.28 that compares favorably to the Chevrolet Volt (0.29). Hyundai’s signature hexagonal front grille and detailed swept-back headlights give Elantra a compact athletic face. The assertive stance is complimented by 15-, 16- or 17-inch alloy wheels and athletic proportions. Available fog lights and side repeater mirrors complete the distinct design. 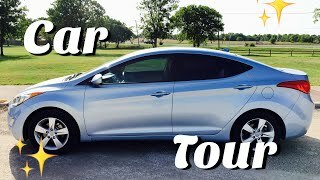 Elantra was designed at Hyundai's North American Design Center in Irvine, Calif.
Elantra’s standard fuel economy is 29 mpg city and 40 mpg highway, with the six-speed automatic transmission or manual transmission. These figures give Elantra a highway-only driving range of up to 500 miles. Under the hood, the Elantra is powered by an all-new 1.8-liter Nu four-cylinder engine with 148 horsepower and 131 lb-ft of torque (145 horsepower and 130 lb-ft of torque for Elantra PZEV). Thanks to advanced clean engine technology, most Elantras sold in California, Oregon and several Northeast states are certified as Partial Zero Emission Vehicles (PZEV) by the EPA. The PZEV Elantra is as clean as many hybrid electric vehicles. The PZEV Elantra helps Hyundai meet its environmental commitments. Outside of these “green” states, the Elantra is available as an Ultra Low Emission Vehicle (ULEV). The Nu engine features an aluminum block with a cast iron cylinder liner, cylinder head and crank. This unique configuration results in a block that is 30 percent lighter than an iron block, shedding more than 74 pounds off the entire engine weight, while still providing comparable strength. The 1.8-liter Nu also offers Dual Continuously Variable Valve Timing (D-CVVT) camshafts and hydraulic engine mounts for optimum power, efficiency and refinement. Using CVVT on both camshafts has several advantages when compared with using it just on the intake camshaft including, a two percent improvement in performance (increased volumetric efficiency), two percent improvement in fuel economy (reduced pumping loss) and a 30 percent reduction in hydrocarbon emissions. In the valvetrain, roller swing arms and hydraulic lash adjusters reduce valve driven friction to improve fuel economy one percent compared with direct valve driving. The Nu engine also features a maintenance-free silent timing chain system to enhance durability and improve Noise Vibration and Harshness (NVH). The application of a plastic two-stage Variable Intake System (VIS) versus aluminum, enables switching between long and short intake manifolds, resulting in a four percent improvement in performance, a 15 percent reduction in cost and a 30 percent reduction in weight. Another tool Hyundai engineers have incorporated into Elantra is an electronic throttle control. The electronic throttle control replaces the conventional cable and mechanical linkage with fast responding electronics. This system accurately controls air intake and engine torque, improving drivability, response and fuel economy. The Elantra also features double-pipe plumbing (internal heat exchanger) to improve cabin cooling performance, while minimizing the capacity of the compressor to further reduce fuel consumption. An external controlled variable compressor is also used to improve fuel efficiency. The Nu four-cylinder engine also has an offset crankshaft design that reduces friction between the piston and cylinder wall for a one percent improvement in fuel economy. The 2012 Elantra can be equipped with a six-speed manual (M6CF3-1) or automatic (A6GF1) transaxle with SHIFTRONIC manual control. The all-new six-speed automatic is 11 pounds lighter than Hyundai’s global five-speed. It is considerably simpler, having 62 fewer parts, which is key to increased durability, lighter weight and lower cost. It also features a super flat torque converter that shortens the unit's overall length by 0.43 inches, while being 2.6 pounds lighter. This transmission mated to the 1.8-liter Nu engine helps Elantra deliver improved fuel efficiency - 11 percent more than its closest competitors and a four percent gain in fuel economy. Elantra’s six-speed manual transmission is also all-new and provides crisp shifts and further optimizes engine performance. These crisp shifts are courtesy of triple-cone synchronizers for first and second gears, double-cone for third gear and single-cone for fourth, fifth and sixth gears. Elantra is a “class above” when it comes to interior room, in comparison to the new Honda Civic and Toyota Corolla. In fact, the Elantra is so roomy the U.S. Environmental Protection Agency (EPA) classifies it as a mid-size car, not a compact car like Civic and Corolla. Elantra’s total interior volume of 110.4 cubic feet beats the 2012 Honda Civic sedan, 2011 Chevrolet Cruze, 2012 Ford Focus and 2011 Toyota Corolla. Surprisingly, it even surpasses the Acura TSX (107.1 cu. ft.), Nissan Maxima (110.0 cu. ft), and VW CC (109.3 cu. ft.) in total interior volume. Ultimately, the long wheelbase allows for compact car efficiency with mid-size car comfort. An example of this is found in the long seat track, delivering best-in-class front seat legroom. Elantra’s trunk volume at 14.8 cubic feet also beats Civic and Corolla. The Elantra is fitted with a McPherson strut front suspension, with coil springs and gas shock absorbers. The rear suspension is a light weight coupled torsion beam rear suspension for enhanced steering stability and monotube shock absorbers for ride comfort. A 23.0 mm diameter front stabilizer bar helps reduce body roll when cornering. All Elantras have column-mounted, motor-driven electric power steering that adjusts instantly to changing driving conditions while improving fuel economy over a conventional steering system. A quick-ratio steering rack is used for crisp feel on turn-in. Elantra’s turning diameter of 34.8 feet is better than Corolla’s at 35.6 feet. Elantra leads all of its competitors in weight efficiency and power-to-weight ratio. Elantra’s widespread use of high-strength steel provides increased body stiffness at a lower body weight. High-strength steel allows the suspension to work optimally. At 2,701 pounds, the automatic transmission Elantra GLS is lighter than its competitors, while offering more interior room than Focus, Cruze, Civic and Corolla. This weight efficient unibody architecture allows for Elantra to achieve an estimated 40 mpg EPA highway rating, without the need for a special eco model. Inside the Elantra, customers will find Hyundai’s expertise in interior packaging, lighting, leading-edge design and craftsmanship. This approach is visible in the clarity of the instruments and the tilt and available telescopic steering wheel. The seats are made of lightweight, environmentally friendly foam. Heated seats are available in the front and the rear, a segment first. Not only does Elantra have multiple storage areas, but it delivers useable storage capacity. The 2012 Elantra GLS has a two-tone interior with a choice of either gray or beige. The Limited trim adds a monotone black interior. All Elantras have cloth-like pillar trim made of fibrous tissue and volcanic rock for a premium look and feel. 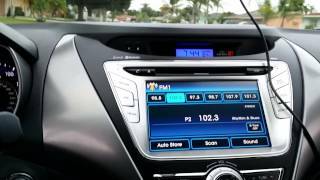 Elantra is available with two audio systems. Standard is a 172-watt AM/FM/Satellite Radio/CD/MP3 audio system with six-speakers and iPod®/USB/auxiliary input jacks. A 360-watt system with external amplifier is optional. Touch-screen navigation is available on GLS and Limited trims and includes a high-resolution 7.0-inch screen and voice-activation by headliner-mounted microphone. The sound system plays compact discs, accesses digital music files via Bluetooth streaming audio or allows driver and passenger to access their personal listening devices through the iPod/USB/auxiliary inputs. Bluetooth audio wirelessly streams music from select mobile phones to the head unit. The XM Satellite Radio interface is also integrated into the navigation unit and features channel logos, real-time NavTraffic and XM Data services, such as XM NavWeather®, XM Stock Ticker and XM Sports Ticker. The system also integrates a rear-view camera, which cannot be found on the Honda Civic or Mazda 3. Users can even upload personal pictures from a USB rather than a CD to be displayed on the system’s home screen. Elantra owners can also get premium features, such as a proximity key with push button start and immobilizer, power sunroof, one touch driver’s window and leather seating surfaces. This modern, sophisticated interior is also whisper quiet. Elantra has Vehicle Stability Management (VSM) to optimally manages ESC (Electronic Stability Control) and the Motor-Driven electric Power Steering (MDPS). VSM works to control two effects. The first is when a driver accelerates or brakes on a split-mu surface (slippery on one side, dry pavement on the other) and the vehicle wants to pull in one direction. VSM detects this condition and sends a signal to the MDPS to apply steering assist. VSM counters the pull and automatically provides eight Newton meters of counter steering. VSM reacts the same way during sudden lane changes or fast cornering. Elantra features six airbags—including dual front, front seat-mounted side-impact, and front and rear side curtain airbags. The Elantra also features a state-of-the-art braking package. The package includes four-wheel disc brakes and an Anti-Lock Braking System (ABS) including Brake Assist, which provides maximum braking force when a panic stop is detected. Electronic Brake-force Distribution (EBD) automatically adjusts the braking force to front and rear axles based on vehicle loading conditions. This package delivers shorter braking distances from 60 miles per hour than Corolla and Mazda 3. Elantra engineers even looked at something as simple as the parking brake, with a rear parking brake caliper for weight reduction. In terms of passive safety, the Elantra has strong unibody construction, along with front and rear crumple zones, and the rear doors have internal dual beams unlike some of its competitors.